The time has come when you finally have friends and family visiting your new place. And if they are from out of town, they may be staying a few nights under your roof. However, while you have the space for a guest room, you don’t have any furniture in there yet, nor the budget to head to the nearest furniture store to purchase items to furnish the room. You want your guest room to be inviting, and finding quality and affordable bedroom furniture and decor can be an overwhelming challenge. Luckily at Consignment Furniture Showroom & Gallery, we sell a variety of affordable new and gently used furniture. In this article, we are going to share some helpful tips for setting up the ultimate guest bedroom. Cozy and comfy bedding is one of the most essential aspects of a guest room. If your guest room only has one thing, make sure its a bed. If you are working with an air mattress, top it with a piece of memory foam to increase its comfort. Choose nice satain sheets and a variety of pillows. Your guests will likely have luggage and other belongings that they will need to keep in the room. If the room does not have a closet, consider getting a clean, gently used dresser to put in the room. This way they have an area to place their clothing and other items in. There are a variety of pieces you could add to a guest room to create a warm and welcoming feeling. However, if you do not have the budget to go all out, focus on the bedroom essentials first. Think of your own bedroom and the furniture and items you have in there. Placing bedside surfaces, such as end tables or nightstands will give them an area to place their glasses, watch, and other essentials. Lighting, such as lamps or sconces will provide ambient and task lighting, and — if you have space — adding an upholstered chair is a nice touch. Your guest bedroom should be unique, fun, and personalized. It’s worth it to go a little bolder or infuse your guest bedroom with some quirky elements — your guests will enjoy the uniqueness and won’t have time to get tired of it like a regular bedroom. 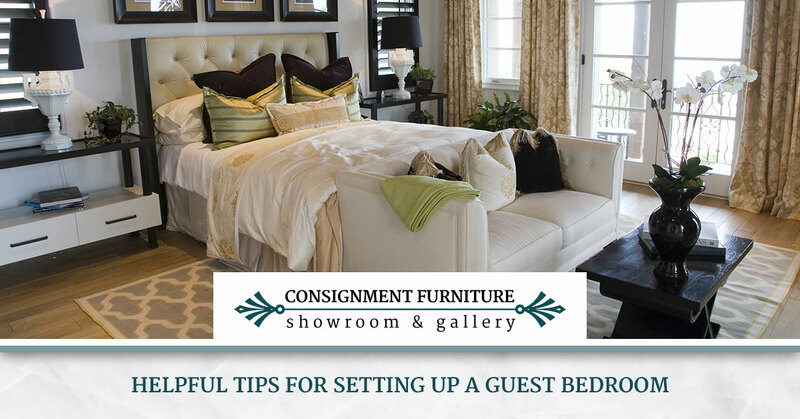 We hope these few tips will make setting up your guest bedroom easier. If you are in need of affordable bedroom furniture for your guest room, shop the available selection at consignment furniture showroom.